Julia Elizabeth Evans grew up in the South (Little Rock), went to the North for college (Boston), then ended up back in the South (New Orleans) working double duty as a documentary filmmaker and creative director for the commercial film agency Markham Park. Her life wasn’t always this spontaneous (or geographically ambitious) though. During her undergraduate years, she toiled away in philosophy classes, doing her best to write the most sound, cogent philosophy papers in the entire university. But a chance encounter with a particularly rigorous philosophy professor turned into a revelatory moment — she was actually destined to become a filmmaker! Now she’s released two versions of her first documentary short: Corner Stores. In each version (30 minutes and 15 minutes), Evans covers the great cultural history of corner stores in New Orleans by focusing on specific corner stores that still thrive today. 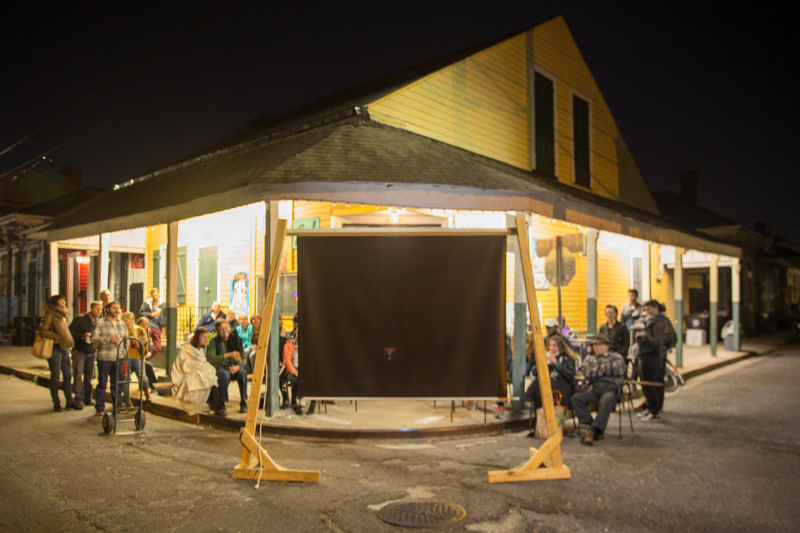 Both a celebration of regional culture and a cry for the preservation of what makes New Orleans so unique, Corner Stores is a welcome addition to the great short documentaries already in existence about the area. Miniflix talks with Julia to discuss how she combines her artistic sensibilities with her intellectual ones, what it means to make an essentially New Orleans film in New Orleans, and why even commercials and branding projects need story structure and good characters to be a success. Miniflix Interviewer: When did you first fall in love with filmmaking? Was it a specific movie you watched or experience you had? At first I felt affronted, because I felt like he wasn’t taking me seriously as a philosopher. But what ended up happening was that he took me under his wing and showed me how to be a filmmaker. It was a very academic program with an analytic philosophy curriculum. Meaning, we didn’t study Jean Paul Sartre and Simone de Beauvoir to learn about theories. We studied these philosophers to argue with them, so it was a totally new thing for him also to think of a student as something other than a philosopher. Miniflix: How do you a find a creative (or personal) angle for commercial/branding projects? Julia: I work with people who are very talented. I’m good with the camera, but they’re great at the camera, so there’s already this baseline that we have….we know that whatever we shoot is going to be beautiful. So I never have to approach a project asking, “how are we going to shoot it?” because we already know how we’re shooting it intrinsically. Beyond that, for me it’s always about what the story is. Beginning, middle and end. And it can be a subtle thing — especially in the commercials. I mean, you wouldn’t necessarily gather a story immediately from watching a commercial I’ve produced or creatively directed, but there is an intentional amount of critical thinking about story that goes into pre-production of commercials/branding projects. I always want commercials to involve a character, or a set of characters who are unique. Basic, elementary stuff. But just making sure that it’s there. Plus, knowing whatever we do will be inherently very artistic. M: What do you think a 30 second or 1 minute commercial can do artistically that no other version of film & media can do? J: For me, it’s a challenge. We all know that our attention spans are short, and for that matter, a commercial — or the form of a commercial — is 30 seconds. Always has been. So, the same must be true on the internet. So that’s why it’s been necessary to keep it at that length. Because social media allows for that. Beyond that, I think it’s a really great challenge; how can we distill the idea — the story of the client that we’re working with — in 30 seconds? Making that [the 30 second commercial] possible is a really great critical exercise for me. Especially as a storyteller. M: You worked with Ross Kaufman and Sebastian Junger, directors ofRestrepo (Oscar-nominated for Best Documentary in 2010). What did you work with them on, and what was that experience like? J: I connected with Sebastian Junger and Ross Kaufman through Gary Knight. Let me start with Gary Knight…a wonderful person as well as an influential photojournalist. He founded IV Photo Agency and sort of came up with the job title of photojournalist before it was really established. Gary hosted this incredible year-long workshop for undergrad students at Tufts University. I was selected for the course, an incredible honor. There were only 8 or 9 of us. The workshop pushed me out of my philosophy classes and into Boston. No kidding, Gary would give us better marks if our project required us to take a bus route. The class met twice a week. Each lesson, I found my whole body arching forward, leaning in to hear his every point and all those coming from my excited classmates. Gary helped us see streets for their beauty and to understand the ordinary as wise. Through Knight, I gained further mentorship from Ross Kaufman and Sebastian Junger at the Bronx Documentary Center. I got support from Tufts to commute between Boston and New York for a few months. I workshopped with the incredible Sebastian Junger, who taught me that “the world outside will always be more inspiring than what’s inside your head.” Sebastian Junger distilled the major point that storytelling is essential to documentary filmmaking. Ross Kaufman also trained me on a more expansive array of camera equipment. Both Gary Knight and Ross Kaufman trusted me to use their cameras: Knight — his Canon 6D and Kaufman — the camera used in Born into Brothels. Goodness, I was so fortunate to have these experiences. I discovered awesome personal strength. The kind of confidence and inner strength I needed to go out in the world and really be a documentary filmmaker. M: Corner Stores: The Documentary: How did it start? What was the inspiration? What’s the major difference between your 30 minute original short doc, and your 10–15 minute version you showed at the New Orleans Film Festival? J: I started the film right when I moved here [New Orleans]. That was three years ago. It was a slow process, but I wanted to really take the time to find the right stories, find the right voices. You know, I literally had no budget, so it was always just me making it on the side. Through NOVAC (New Orleans Video Access Center) I got validation. They really encouraged it. I met my first-ever producer. Her name is, Ashley Spears, born and raised in New Orleans, and we just started going out together — sometimes weekly, sometimes monthly. We’d go out with my camera. She was my apprentice in a way, because she wanted to learn about camera stuff, and she was also my ambassador. We’d go into corner stores and ask the same question, over and over, to whomever would talk with us: “In your own words, what is a corner store?” So we built on that, and knew we wanted to do some features on the stores. We got some longer form video interviews with store owners. 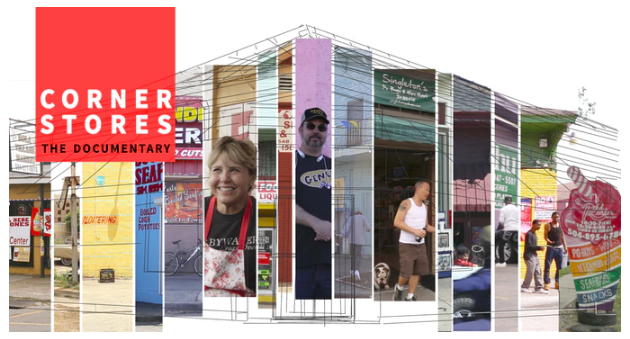 It became this great film, a 30-minute documentary about New Orleans’ corner stores. I actually just got a grant to screen the 30-minute piece at actual corner stores, so we will host those in February 2019. As for the shorter piece for the 2018 New Orleans Film Festival… This Tricentennial Story Incubators grant came up, and I applied for it. I was super fortunate to get it, and I got a lot of good mentorship from it. I chose Singleton’s Mini Mart to be the main featured corner store for this film. Originally there were four main corner stores featured in the 30 minute piece. M: In your Kickstarter project, you considered the documentary project to be indebted to cinema vérité style. How did you intend on bringing vérité elements to the film? How did this look in a practical way? J: When folks saw the trailer and when I finally screened it, they would say, “Yeah Julia, you really know how to do vérité.” And I was like, what do you mean by that? Well, it was a simple answer: “You know how to capture the scene as it’s happening.” So, as a brand-new filmmaker, with this being my first real film, those comments really gave me the confidence to move forward in that direction. For me though, I wanted to create a cinema vérité that wasn’t just handheld; I wanted it to be more cinematic. I’d just gotten a new camera right as I started working on the film, so the coloring isn’t quite as crisp as I’d be able to make it now… But I wanted the cinema vérité elements to still be cinematic, and that meant always having my camera on a tripod. And that took a lot of patience. There’d be so many times when I’d want to really get in there and grab this conversation and that conversation. But I had to resist. This was the style that I chose to do. Very purposefully composed and therefore intentionally still. M: What camera did you use? J: I was using a very basic camera the last three years…my Canon 6D. That’s how I shot the original 30-minute piece. Then when I got the Tricentennial grant, I got the Sony A7S2 and went right into interviews. I just didn’t have enough time to experiment with it then. Now I do. So yeah, I use the Sony A7S2; I use my Canon lenses. And that is it. Very bare bones shooting. The Sony AS72 is great…because there are a lot of ways you can color your footage. M: What was the production process like? Ex. how many days, what kind of equipment did you have, etc. J: I was really fortunate that I’d already done a formal documentary interview with Bau [Nguyen] two or three years ago now. So he knew what I was doing…but he didn’t really know at the same time…. So, starting in January I started to shoot the shorter 15-minute piece. I shot it in two months, but I went on 20 different days to shoot, just to get all the little pieces. I’d go a lot during Uptown Thursdays to get footage…and a lot of times I’d just be drinking with them and hanging out. I was never shooting a whole lot during those times. But I just wanted to be with them. And get shots when I could. It truly was great how supportive everyone was. I never want to do a documentary where there’s resistance to me being there or to my camera. There are some filmmakers that can do it…it has to happen in some contexts, but for me and my filmmaking style, I want to be very, very comfortable. So when Bau said what he said about painting my masterpiece…that was an incredible moment of validation. M: You do a great job of isolating certain elements or objects that become motifs, like the dominoes or the Miami Dolphins gear. Did these now-iconic images get found in the editing room, or could you tell while shooting that they would become important to the final version? J: I think it was the latter, because I had already done the original 30 minute piece — and that one also featured Bau and the corner store Singleton’s Mini Mart. So I’d been in that space. But I was very clear about the things I caught…like there were these little ketchup cups they took shots out of, and that’s so significant. With the Miami Dolphins? That’s just unavoidable. I wasn’t actively trying to. That’s just Bau. It’s funny you mention that, because he would appreciate that. For a New Orleans film, what an ironic thing to be featured. I actually wanted to avoid that, but on the day of his interview he was all decked out in Miami Dolphins gear. Funnily enough, it actually made editing easier. Because of all his Dolphins stuff, there was this inherent visual consistency that I didn’t have to worry about. Like, I would sometimes be cutting to Bau on a different day with a different Dolphins shirt, but to most people, he was just wearing the same shirt — and made it feel like the same day. And that’s the thing about corner stores — in a lot of ways, every day is the same day. But you love it, because of the people. M: When creating questions for a documentary, can you typically tell which answers will make it into the movie, even as you’re shooting them? J: I don’t think so. I always do pre-interviews, just because I like to have that level of control and understanding. Now that I’m a better interviewer, my focus is on making people feel comfortable. So a pre-interview just helps me be aware of when I need to be a little more patient with somebody, because maybe it’s a little harder to talk about this or that thing. Some people don’t like to do pre-interviews because they think it will compromise the actual interview. My thought is that people repeat stories to their friends all the time — and it’s the same story, told just the same way…with just as much feeling the second time. I have to have a level of comfort where, if they tell me something, it’s like they are telling a friend. They have to feel so comfortable that when they tell it to me it has to feel the same as with friends…just as alive. In the pre-interviews, I decide what I want to leave out. Most of the stuff I get in the actual interview is usually pretty useable by then…and then I decide what to keep and what to leave out. I’d say that it’s actually the vérité elements that decide what story needs to be told. M: What’s the long term exhibition goals for this film and for the 30 minute short? J: Well, I’m proud of both of them. The original 30 minute piece is so essential to New Orleans filmmaking, not speaking for myself as much as for the subject matter. I mean, I’ve shown the 30 minute piece all over town… I’ll be at a house party or nice holiday dinner and we’ll be talking about the film I’m working on, and I’ll just show it to them. And everybody is so happy about the film. What I’ve seen is that it’s essential to anyone who’s lived here a long time. Whether we go to the corner stores or not, we interact with them — even by passing by them. It’s important to me that people in New Orleans get a chance to see it. Especially the 30 minute piece, because it has so much good general information that’s cool to have and cool to be informed about. The Singleton’s Mini Mart piece that played at NOFF 2018 is a great piece for someone who’s looking at it as a stepping stone piece for someone working on becoming a filmmaker. I really wanted to have this experience of making a shorter, 10 minute film, but most important to me is that the 30 minute piece is distributed throughout the city of New Orleans. M: What two pieces of advice (something they should do and something they shouldn’t do) would you give a filmmaker attempting to make their first short documentary? J: Everybody says this, but it’s really true: just shoot and edit. Make your thing. Make the thing that you want to make. If you’re inspired, go ahead and make it because — before I started working on the Corner Stores film I’d just moved to New Orleans, so I was shooting like weird pieces of my friend’s kitchen table. And eventually those experiments informed how I shot kitchen tables at corner stores in the documentary. So shoot, then review your work. The three steps would be: shoot, review your work and then critique it. More than that though…. Still to this day, whenever I talk to my Pa about ideas for projects or even projects that I am currently working on, it’s like talking to a brick wall. He’s not interested until the project is finished. (Not close to finished. It has to be finished.) So, really my best advice to filmmakers comes from my Pa. Finish what you’re working on and move on. That’s the only way you’ll get better. The thing I would avoid doing is…being quiet about your film. Don’t be shy talking about your film, even if you’re the only one working on it. Talk about it with people… For example, I was at NOVAC and there was a conversation about whether they were going to do a documentary workshop. And I just brought up corner stores as a documentary idea for the workshop even though it was a small, small idea back then. Three years later, here I am. Because I talked, I’ve been fortunate to have received a lot of good feedback on the film as well as grants for the film. Avoid being shy about the film you’re working on. Talk about your film. Really just talk about your film. Because no one’s going to steal your idea. It’s your idea. No one is going to steal your voice. M: What’s your favorite short film, commercial, or other short media? Why? J: I love, I love, I love Chris Marker. I return to La Jetée all the time….it gives me hope, as far as wanting to be a documentary filmmaker and also wanting to be a narrative filmmaker. I want to bridge those two things. He did that when he made La Jetée four decades ago. It’s 20 minutes of narration over still images. He tells a story that actually was the story for 12 Monkeys. Just the way he uses really simple images…I return to those frames a lot, those expressions…he shows how much facial expressions can do for a story. The images in La Jetée are so emotional, yet simple. 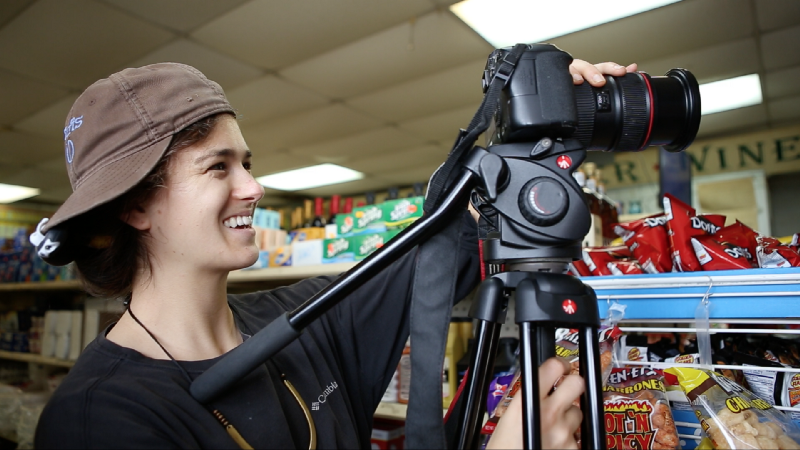 To see Julia’s commercial work, and other clips from The Corner Stores Documentaries, go to https://vimeo.com/juliaelizabethevans.